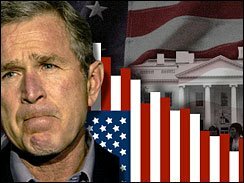 This picture accompanied an article titled "Poll: Bush Ratings at All-Time Low". Is this a limbo? How low can they go? Ha. George Bush is the missing link. Also, Josh Lucas is the fake Matthew McConaughey.